Home / Income Tax / What to do if you file an error in your Income Tax Return? 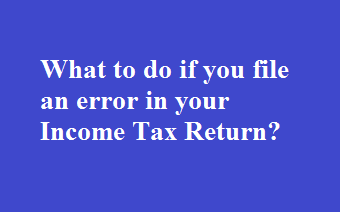 What to do if you file an error in your Income Tax Return? What is a revised return? Where a taxpayer has discovered any error in the original return which has been filed or wishes to omit any incorrect information provided in the return or provide any additional information, then the return filed for carrying out such changes is referred to a revised return. Who is eligible to file a revised return? First and foremost, in order to revise a return, the tax filer should have committed an error while filing his return originally. For instance, if a taxpayer is paying EMI for a housing loan but has failed to claim the interest and the principal portion as a deduction in his return. In this scenario, he can revise his return for claiming these deductions and accordingly bring down his taxable income and hence his tax liability. Earlier i.e. until the financial year (FY) 2015-16, only those returns which have been filed originally within the specified due date will be allowed to be revised. However, beginning FY 2016-17, even belated returns can be revised. Further, as regards the time limit for filing revised returns is concerned, previously, a revised return could be filed anytime within two years from the end of the relevant FY. From FY 2017-18, the time limit available has been reduced to one year from the end of the relevant FY. Based on the above, the due date for filing a revised return is March 31 of the assessment year for a relevant financial year. Considering the income tax return has been filed for the period April 1, 2017 - March 31, 2018 i.e. FY 2017-18. The relevant assessment year will be April 1, 2018 - March 31, 2019 i.e. AY 2018-19. Therefore, the revised return can be filed anytime before March 31, 2019. Here, one must also note that, a return, not only filed, but also processed by the income tax department can also be revised as long as such revision is done within the prescribed time limit. Correcting the information which you wish to rectify or disclosing additional information. At the time of filing revised return, it must be filed under section 139(5) of the Income Tax Act. On selecting the revised income tax return, you will be asked to populate details regarding the original ITR, i.e. receipt number and date of filing of original ITR. How many times can a return be revised? There is no restriction on the number of times an original return can be revised. However, it cannot be revised after the due date i.e. March 31. Each time a return is revised the details pertaining to the original return must be disclosed. However, it is suggested not to revise a return too many times as it may attract the attention of the income tax department. Therefore, in case you are unsure as regards filling in any details in your return, please consult an expert to get it sorted out. Is the revised return required to be verified? Yes. The method of filing and verification of a revised return is similar to that of an original return. Therefore, each revised return is required to be e-verified. E-verification can can be done by generating the Electronic Verification Code (EVC) through the modes listed by the income tax department. These modes include net banking, Aadhaar card, Demat account, ATM or OTP. Alternatively, a physical copy of the ITR V can be sent to the CPC in Bengaluru.